To say I'm in love with Pantone's choice for 2013 Color of the Year is a sever understatement! Truth be told I'm kind of obsessed with it! Now because I'm so obsessed I decided I'd start a little mini series over the next 3 weeks on exploring the color of the year, Emerald! For our first week I wanted to touch base on some options you can have for your nails just cause I got some new polishes for this specific reason...well not the blog post but because of Pantone's color choice... I've decided on three colors that I am really enjoying that work for this year's color! Sonia Kashuk - Emerald City: I picked up my at Target for Sonia's Fall 2012 collection. It is a cream formula with an amazing color pay off and gives you more of a straight forward Emerald color. China Glaze - Agro: Released with The Hunger Games collection representing District 11 - Agriculture is a metallic green with gold undertones. Essie - Crocadilly: A crocodile hunter green as described by Essie which offers a scaled reptile effect with the help of of that magnet atop of the nail polish bottle. This polish offers more of a silver under tone. I haven't had much luck with the magnet effects but I really love this shade of green. 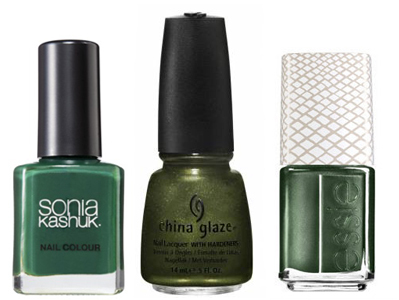 Do you have a favorite emerald shade polish? I'd love to hear what's your favorite color for this year!